Just last month, I had the honor of being interviewed by a writer from the Marianas Variety. A young lady by the name of Amber Word (not Amber Wood, as the article stated) asked if she could interview me for a possible article on indigenous weaving to be published in the paper. 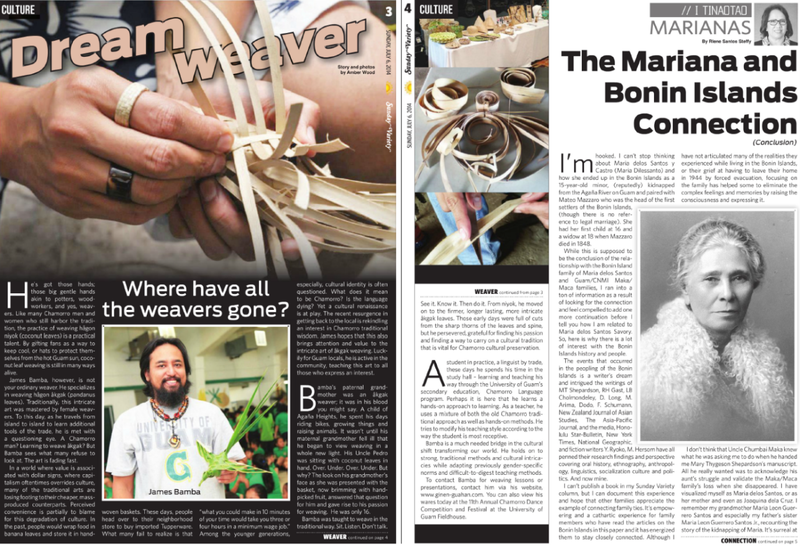 On Sunday, July 6th, 2014, the article titled “Dream weaver – Where have all the weavers gone?” was published. I thoroughly enjoyed the time spent with her, even though it took quite a bit of time to setup for the interview! I wanted to make sure all bases were covered and that any questions that might be asked could be answered quickly and easily through seeing the things I would be talking about. So I setup up a fairly large display of what woven items I had available. Here’s a photograph! I fear that I may have talked and talked and talked forever, as I’m pretty passionate about weaving. I talked about mostly everything! How it all started, my journey up to this point, what I can weave, what I plan to weave, what materials I use, and well… The list probably could go on and on and on. So, after a few hours of enduring the pain and suffering of my babbling on about weaving, I figured I should let her go and not tåne’ (detain) her any more. After all, I thought it would be neat to be in the paper, so I better stop talking before she hates weaving! A week or so later, there’s an article in the Marianas Sunday Variety with really neat photographs of my work, and a write up that was true to the interview. I’d like to thank Ms. Word for the opportunity to be interviewed and for the efforts she put in to write and submit this article. 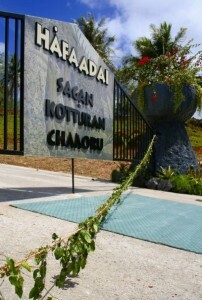 It not only helps to perpetuate, preserve and protect the Chamorro culture, which that in and of itself is worthy of praise, but it exposes the masses who read this paper, both on island an across the globe digitally, to a facet of the Chamorro culture that isn’t seen on a daily basis, if ever. Si Yu’os Må’åse’ ni todu i bidå-mu, Amber! Here’s a screen shot of the article. Exciting news! The Sågan Kotturan Chamoru, or Chamoru Cultural Center will be opening it’s doors to the public, THIS Friday, August 15, 2014! The Center’s Hours of operation will be Monday through Saturday, 11:00am to 6:00pm. The center will soon provide various educational and cultural programming for the community that will focus on Chamoru culture and language, and will include instruction and apprenticeship programs in various traditional and contemporary art forms such as weaving, carving, body ornamentation, dancing/chanting and other areas that identify our unique and rich culture. Si Yu’os Må’åse’ mañaina-hu yan mañelu’-hu. I have setup a display at the Guampedia.com Community Gallery starting on the 25th of July and will be there till the 30th. The Community Gallery’s current location is at the Julale Shopping Center, 424 West O’Brien Drive, Hagåtña, Guam 96910. The install seems to be working. A big Si Yu’os Må’åse’ to Amber from Blue Amber Trio for her assistance in guiding me through the website overhaul. The overhaul seems to be going pretty smooth and I just have to port a tad bit more information onto this new shell and all should be gef bonitutu. Si Yu’os Må’åse’ for your continued support! Updating the Ginen Guåhan website! Stand by to stand by! I’m currently giving the Ginen Guåhan website a fresh new look, leaving the dated and early 2000’s website behind! New ideas and concepts to provide my visitors with a user friendly and welcoming experience!